The Brickyard has been established as a “bring your own tents” campsite for a few seasons now. We have a loyal following of campers who come year after year. Our glamping tent is a recent addition but one we are very proud of. Everyone loves the forgotten feel of the place, the slightly wild nature, the way nature seems to be reclaiming the old brickyard for herself. Some of the remains of the brickmaking industry are still visible, waiting to be rediscovered in the undergrowth. We think this heritage helps create an unusual and authentic glamping experience. In 2016 we got a little more serious and installed a new watermain to provide fresh drinking water to standpipes around the site. We also started to add some improved facilities such as a flushing loo, a sink with hot and cold running water and a shower that works at the touch of a button. These little cool camping touches go a long way to making your glamping enjoyable and hopefully will make you want to come back again and again. 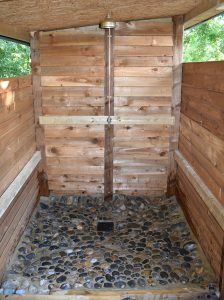 We kept the compost loo and the bucket shower because people like using them, especially the bucket shower, how often do you get to have a shower under a tree? Galmping isn’t all about luxury, it’s about getting back to nature as well. 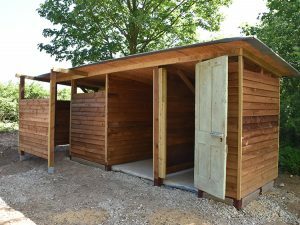 The new flushing loo, hand basin and shower hut complete with hot and cold running water. The site is very peaceful and relaxing. We often get stunning night skies as there is very little light pollution this far from built up areas. Some families choose to stay onsite and just hangout with the communal barn, the wild creatures and the peace and quiet. We love camping and glamping ourselves, any chance to get out under the stars. 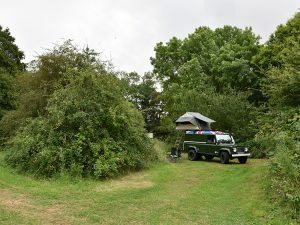 We try to provide the sort of camping experience we want when we look for a place. If you’re feeling more adventurous there are so many things to do nearby that a whole week would not be enough to see and do everything.